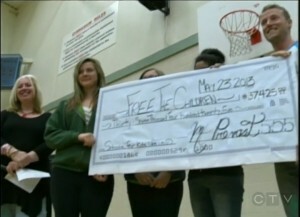 That’s me, on the far left, and the Giant Cheque being handed over to Taylor Conroy. In order to understand why this massive cheque is massively important, I need to tell you who all of the people (or tops of heads) are and how we all are connected. It’s a story that took just shy of 2 years to tell. I’d like to not only tell my story, but share complete details so that anyone else who wanted to write a massive cheque to help children get educations could do the same. The story starts, as stories often do, with a single word: Inspiration. Along the way, inspiration took many forms. The three students who stand between the adults represent different moments in the project–one girl just took on the idea with such gusto she canvassed her neighbourhood, talked to her coaches and shopkeepers and anyone who would listen about our goal to raise $50 000. Strangers wandered in to the school to drop of donations because Kayley inspired them. Another girl in the photo is Bailey, who, along with her brother, made a sweet little video called “It’s time for change” that featured some of our students talking about why they wanted to help less fortunate kids. And then there is Aneesha. Who quietly and humbly came to me one morning and asked if it was possible, could we please consider making the school in India an all girls school. She went on to share with me things she knew about how girls her age were treated in India, and how infant girls were disposable in some regions, and other things that a teenage girl living in Canada should know nothing about. My coworkers and community inspired me too, along the way, and there was never a shortage of ideas, just sometimes a shortage of time to implement them. We also had events conspiring against us, which is why we weren’t able to meet our original goal, but in the end I think we learned even more about setting goals and persevering and celebrating success than we might have otherwise. Below I have compiled a list of ideas we had to raise $50 000. Some we didn’t actually execute, but all are viable, and appropriate for almost any grade level. Some require an initial cash outlay, some can be done for free. I’m sharing these ideas with a goal to inspiring others to do what we did, and also as a reminder to myself of what is possible…. One of the difficulties I had was getting the community involved. I didn’t want to rely just on the school community to raise all the money, I wanted to let the whole town in on it too. I discovered that was a little tougher than I realized, and strangely, people didn’t start calling me up, asking to donate money. Establishing a fund-raising committee, then, requires that members have different skill sets. For my part, I was mostly running the show, and missed some opportunities just because I only had so much time to make them so. If you’ve come to this page looking for fundraising tips, please don’t hesitate to contact me (through the comments, or via email). Here, then, is my Inspirational Ideas for Increasing Input to your school charity. “Coupon” books– these were for parents to buy, and included things like kid- coupons for mowing the lawn or doing dishes. School cookbooks. This included not only contributed recipes from staff, but recipes for most of the things students made in Home-Ec, so it served as a really nice keepsake. If I were to do it again, I would have students take pictures of completed items and run photos as well in the cookbook. things the kids can make and sell– bracelets and rings made from re-purposed silverware, birdhouses, enameled or painted “Scrabble tile” necklaces, gingerbread houses. It depends on your grade level and staff support– we are a middle school, so the shops were available to us too. Because I live in a small town, and basically know everyone, this part was easier, but I did a number of community events, such as running a coat-check at a couple of “galas”. They were happy to have someone take care of coats, and I set up a tip jar and posted an explanation of the charity. Most nights I made between $200 and $300. Change Jars. A few people set up “change jars” at their businesses for us. Over the time, this really added up. Contacting “old” Principals. Because we ran the 5*5*5* in conjunction with our school’s anniversary, this was a bit more obvious, but in contacting former staff for the reunion dance, we discovered that many of the people we contacted wanted to make a donation, whether or not they attended the event. Find people who sell MLM products, like “Epicure” or “Tupperware”. Very, very often the company has items specifically intended for school/fundraising. I did an Epicure sale on 2 occasions– a mom in the school was selling it. Multi-Cultural banquet. This was an idea I desperately wanted to do, but never seemed to be able to get going. I tried contacting the inter-cultural society to help, but it never got going. The idea was simply to have the 5 countries represented, and have samples of food from that country available for sale. There were a variety of ways to make it fun– like provide a meal, but the patron can only order in the language of the country, and so throughout the meal may not get, say, a fork until the second course, or dessert first and bread last. It was simple enough to research common foods from each country, and even if you didn’t have someone from that country volunteer to cook it for you, it would be straight-forward enough to do. “Celebrity” cook off– also food related– I thought it would be fun to get 3 “rival” chefs to cook the same dish and patrons could buy tickets in order to sample/judge. Advertising– a local paper offers a “charity” rate for a full-page, the charity re-sells the ad space and keeps the profit. I had wanted to get some of my IT students to do graphic design work on the ads as well, and it would allow for focus on community businesses. I just never got the time to track it all down. Celebrity auction. This has been done in the past, but not recently here– I would have gotten the kids to write to celebrities for autographed items that could be auctioned off. We did get autographed T-Shirts from Nellie Furtado, but the gaming rules are very strict, and we aren’t actually allowed to raffle stuff off– only auction. Fun fair– always a hit, and could include things like a shoot-out against our local hockey team, chance to sledge-hammer an old car, karaoke contest, etc. Requires a lot of parent support, and mostly these happen at Elementary school. Wrist bands and USB drives. These are easy enough to source and I think the profit is fairly decent, I didn’t pursue it because (besides lack of time), I wanted to focus less on getting the kids to buy stuff and more on encouraging community input. Oscar Night. I had this planned with a local wine bar, and right up to the eleventh hour it was a go, but then events intervened and it had to be canceled. This could be a FABULOUS event, though, and easy to plan at an “elegant” venue, because the Oscars are always on a Sunday, and out here on the West Coast air at 5:00pm, so it’s a terrific, fun event. The plan included getting a photographer to take pictures as patrons entered on the (donated) red carpet, ballots to predict the winners, games like “Oscar Bingo” to play while the Oscars are projected on the big screen, snacks and cocktails for sale. You could gather donations of prizes, like a limo ride to the event, gift certificates for the venue, “celebrity” prizes (like the Nellie Furtado tshirts), “Glamorous” silent auction items, etc. Delay-start-change-drive. This idea came from Bailey as well as the video she created– the idea was for a one-week change drive. Every morning, kids would bring in change. As long as it took the teacher to count the change was as long as class was delayed. I thought this was a clever idea, and would especially appeal to older kids. We just ran out of time up here to implement it. I’m sure there is more– I will update this page as I remember more details. Please feel free to use any or all of these ideas, and send me more of your own, too. It is time for change….